If you got a chance to listen to the latest episode of the Mush! You Huskies Radio show you will know by now that the future home of the Team Ineka mushing kennel will be in Willow, Alaska. After almost six months of traveling across North America, searching out suitable properties in Minnesota (twice), California and Alaska, we have settled on the Alaska property. While we would have loved to stay here in the Lower-48 states, it was just not possible. The Minnesota kennels were either too expensive or the county would not allow us to have a sled dog kennel. The California property was very nice but you had to drive well over an hour to run dogs and it was just too hot! The Willow property is not a mansion by any stretch of imagination. 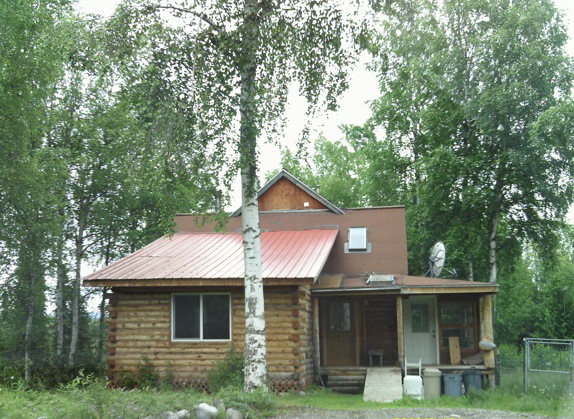 It is a true musher’s property but it does have running water, electricity and full speed internet. There is an outhouse on the four acres “just in case”. It is every mushers dream of finding a place in Alaska, and many of us have hopes of running the Iditarod one day. Team Ineka is one step closer now with the purchase of this property. There are many things that are appealing about this place but a couple to note are: 1. dogs are allowed and we will not need special permission from the county or our neighbors. In fact there are several mushers in the neighborhood. 2. There are already kennel runs on the property. They need repair but they are there. 3. You can run dogs right from your property. I can literally hook up my team and go with a trail-head leading right up to the kennel. Our goal is to spend six months a year in Alaska and six months in Colorado. We will maintain our business, Denver Dog Works here and it will remain fully operational with our third partner taking over the day to day tasks in about a year. We love Colorado but this is a place that we could not pass up. My goal is to run the Iditarod in 2013. I will begin building my team immediately after my arrival in Alaska and start to run races starting this winter. By 2012 I will be running my qualifiers for the Iditarod and enter the race the following year. While I have thought about this dream since the day I purchased my first Siberian Husky in the fall of 1987, it will take a tremendous amount of work to make this dream a reality but this is the first step to make it happen.